In small towns all across the Eagle Ford, decreased oil and gas activity has left a mess of the county roads system. The South Texas roadway problems left in the wake of the shale boom will cost communities in the hundreds of millions of dollars for repairs. Poor road conditions, increased traffic and heavy equipment brought on by the oil boom contribute to the unsafe conditions. 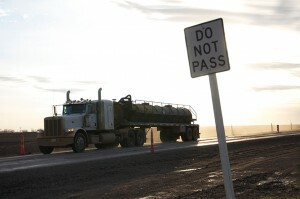 Roads in the Eagle Ford Shale are under intense pressure from the huge volumes of truck traffic that are regularly running up and down South Texas highways – literally hundreds of trips per day in many cases. And, often, the counties have not been able to keep up with the problems caused by the increased volume. The Texas Railroad Commission estimates that it will around $432 million to rebuild the roads in DeWitt County alone.